A folk singer/songwriter from Peterborough, Ontario, Sarah McInnis is a talented multi-instrumentalist and masterful storyteller. With poetic lyricism, her deeply personal songs lend a new authentic voice to universal themes of human connection. Sarah’s stirring vocals and passionate performances reach out to her listeners to transform each stage into an intimate-feeling venue. Her debut EP, Farmer, Coal Miner, produced in 2016 by James McKenty, beautifully illustrates her craft, with an exploration of family ties, home and a sense of place, love, loss, self-awareness, and wonder — all skillfully woven into seven thought-provoking tracks. Sarah has shared the stage with award-winning Canadian musicians Old Man Luedecke, Craig Cardiff, and Mathias Kom (of The Burning Hell) and has worked locally on several independent music projects, as well in collaboration with Wolfville’s own Mud Creek Boys. Most recently she, and bandmate Jesse Carlson, collaborated to record an album in the Manning Memorial Chapel, which will be released in the coming months. Her unique approach to writing, and warm, clear vocals, reminiscent of a time gone by, leave audiences with a lasting impression of her heart-felt honesty and skillful artistry, long after her final note is sung. 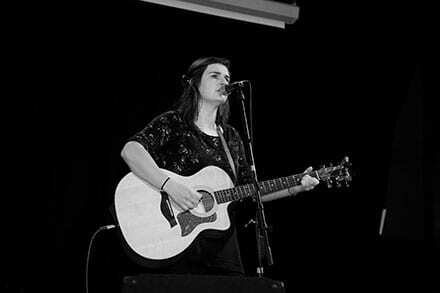 Deep Roots look forward to welcoming Sarah to our stages this year.